In Poland, Easter Monday is known as Śmigus-Dyngus Day or just Dyngus Day when the boys get to douse the girls with water. 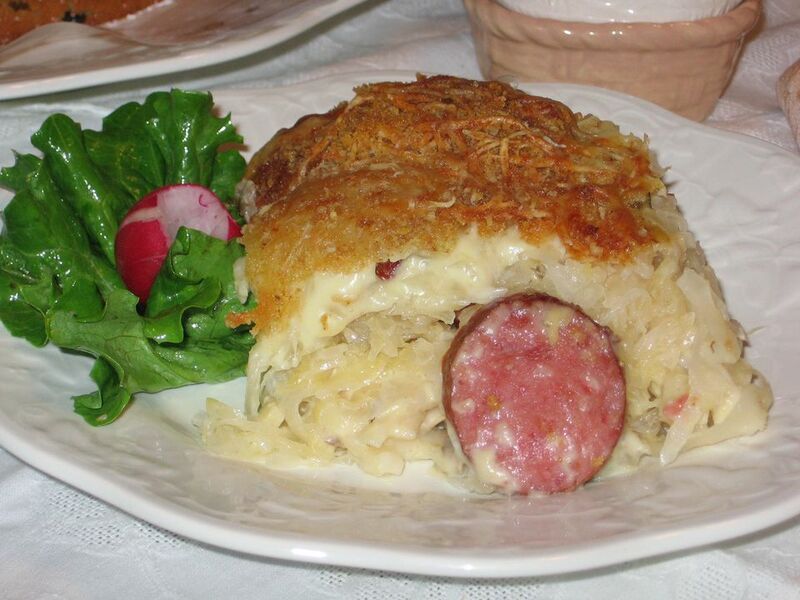 This easy casserole of American origin is a great way to use up smoked sausage and sauerkraut from Easter dinner. For a healthier spin, use low-sodium soup, raw onion, reduced-fat cheese, turkey kiełbasa, no-yolk egg noodles, and rinse the sauerkraut twice. This recipe doubles well and is ideal for a potluck. It can be made in a slow cooker, but blanch them before layering. Cook on medium until kluski is tender. Heat oven to 350 F. Lightly coat a large glass or ceramic loaf pan or casserole dish with cooking spray. Mix together soup, caramelized onion, and mustard and set aside. Layer half the sauerkraut in the prepared pan. Layer half the kluski on top of that, followed by half the kielbasa. Spread half the soup mixture over the kielbasa. Repeat layering with remaining ingredients. Sprinkle shredded cheese evenly over top of casserole. Top with breadcrumbs. Place casserole on a sheet pan to catch any drips. Bake for 50 minutes, rotating a half turn 25 minutes into the baking, or until golden brown and bubbling.